Great article on hunting for doubles, the downest, dirtiest, and most compelling food item in the Guyanese Trinidad/Tobago constellation of deliciousness. One of the more popular pieces I've written, my description of a very trippy dinner at the elusive Dreamaway Lodge (over a decade ago...the place is under new management and is no fun at all anymore) seems to have dropped off the Internet, so I've revived it here (I can only pray that dear Lenore doesn't web surf). Interestingly, the Dreamaway Lodge is alleged to have played a part in Bob Dylan's disastrous, unreleased film Renaldo & Clara (the home movie of his Rolling Thunder Tour). I know Arlo Guthrie used to hang out there a lot, as well. So much has been written about the economic crisis, and the reader is inevitably left slightly bleary, the same way one feels hearing a number of voices speaking around an issue without anyone ever directly addressing it. "Typically, these countries are in a desperate economic situation for one simple reason—the powerful elites within them overreached in good times and took too many risks. Emerging-market governments and their private-sector allies commonly form a tight-knit—and, most of the time, genteel—oligarchy, running the country rather like a profit-seeking company in which they are the controlling shareholders. When a country like Indonesia or South Korea or Russia grows, so do the ambitions of its captains of industry. As masters of their mini-universe, these people make some investments that clearly benefit the broader economy, but they also start making bigger and riskier bets. They reckon—correctly, in most cases—that their political connections will allow them to push onto the government any substantial problems that arise." "[E]lite business interests—financiers, in the case of the U.S.—played a central role in creating the crisis, making ever-larger gambles, with the implicit backing of the government, until the inevitable collapse. More alarming, they are now using their influence to prevent precisely the sorts of reforms that are needed, and fast, to pull the economy out of its nosedive. The government seems helpless, or unwilling, to act against them"
"From 1973 to 1985, the financial sector never earned more than 16 percent of domestic corporate profits. In 1986, that figure reached 19 percent. In the 1990s, it oscillated between 21 percent and 30 percent, higher than it had ever been in the postwar period. This decade, it reached 41 percent...The great wealth that the financial sector created and concentrated gave bankers enormous political weight—a weight not seen in the U.S. since the era of J.P. Morgan (the man). In that period, the banking panic of 1907 could be stopped only by coordination among private-sector bankers: no government entity was able to offer an effective response. But that first age of banking oligarchs came to an end with the passage of significant banking regulation in response to the Great Depression; the reemergence of an American financial oligarchy is quite recent." "Once, perhaps, what was good for General Motors was good for the country. Over the past decade, the attitude took hold that what was good for Wall Street was good for the country." We've all come to buy into that notion (and Bush's attempt to privatize social security was a bald attempt to even more tightly cement that linkage), but it hasn't always been so. The appointment of two successive Goldman Sachs CEOs as treasury secretaries signaled a tightly entrenched channel of influence - personal connections that "were multiplied many times over at the lower levels of the past three presidential administrations, strengthening the ties between Washington and Wall Street." "Throughout my time at the IMF, I was struck by the easy access of leading financiers to the highest U.S. government officials, and the interweaving of the two career tracks. I vividly remember a meeting in early 2008—attended by top policy makers from a handful of rich countries—at which the chair casually proclaimed, to the room’s general approval, that the best preparation for becoming a central-bank governor was to work first as an investment banker." "[M]ajor commercial and investment banks—and the hedge funds that ran alongside them—were the big beneficiaries of the twin housing and equity-market bubbles of this decade, their profits fed by an ever-increasing volume of transactions founded on a relatively small base of actual physical assets. Each time a loan was sold, packaged, securitized, and resold, banks took their transaction fees, and the hedge funds buying those securities reaped ever-larger fees as their holdings grew. Because everyone was getting richer, and the health of the national economy depended so heavily on growth in real estate and finance, no one in Washington had any incentive to question what was going on." Finally, Johnson, whose specialty is, after all, the resolution of economic crises in banana republics, weighs in on how our current crisis is being handled. In true Banana Republic style, we are coddling the oligarchs rather than facing up to the harsh realities of digging out. Some of these [corporate bailout] deals may have been reasonable responses to the immediate situation. But it was never clear (and still isn’t) what combination of interests was being served, and how. Treasury and the Fed did not act according to any publicly articulated principles, but just worked out a transaction and claimed it was the best that could be done under the circumstances. This was late-night, backroom dealing, pure and simple. It's a lengthy article, but well-written and jargon-free, so I hope you'll read through to the end, where Johnson rolls up his sleeves and offers his thoughts for how to fix things. The really good stuff is toward the very end. Oh, and Simon Johnson (who is now at MIT) has a blog. "The most prominent piece of the campaign deployed so far has been a TV commercial in which "Lauren" is given a $1000 budget with which to find a 17" notebook computer. After a brief stop at a "Mac Store" where she comes away empty-handed noting that the only computer available for under $1000 has a 13" screen and saying "I'm just not cool enough to be a Mac person," she settles on a $699 HP notebook from Best Buy." The consensus seems to be that while the ads are deceptive (the $699 HP notebook, with its terrible screen resolution, slow ram, crap battery, lousy 100Mb ethernet, shared graphics memory, Vista, etc., is in no way comparable to a Mac notebook), they are nonetheless a smart play in the bad economy. But I can't see any point at all. People up pay for Macs for two reasons: 1. higher quality/value, and/or 2. coolness factor. This campaign does nothing to contest the former, and actually helps boost Apple marketing on the latter. So the only consumers conceivably targeted by this campaign are those who find Macs neither better or cooler. In other words, the hordes of lulled-out PC users who weren't thinking of switching, anyway. So why spend megabucks to reinforce their lull? Is Microsoft so concerned about its market position that it must reinforce the instincts of consumers who have no Mac appreciation, and so who'd never imaginably pay Apple's premium in a recession, anyway? Six weeks had gone by since the decision was made to close Chowhound. Since then, I'd done a lot of thinking. I could make buckets of money fast, if I was willing to let others tart up the brand. Or I could raise seed money from family and friends and give Chowhound a careful makeover to appeal to biz types...all in my spare (ha!) time. Acquisition was a third option, but it would have to be a company that not only appreciated Chowhound's rare qualities in spite of its rough edges, but one that'd leave me confident that they wouldn't simply turn around and hastily tart up the brand. As the tornado of Web 2.0 whipped up, I held onto the dog's leash as firmly as I could. The only thing to do was to set my sights on companies built around premium-quality content. Not lowest-common-denominator plays for maximal eyeballs, ala Yahoo, but outfits with a more high-minded approach catering to a more discriminating audience. There aren't many companies like that, but one which sprung to mind was Washington Post. I'd written for Slate and Newsweek, been interviewed by Budget Travel, and had spent time with the Post's new food editor (while he created this piece in the Boston Globe). Plus, one of their business development managers had been talking up Chowhound internally for a couple of years. I had ties there. They'd appreciate the unlipsticked pig, and be willing to nurture it. Porcine cosmetics would be applied judiciously. I made overtures, and there was interest. This was a big relief, because, amid the sea of unviable options, my "screw it" impulse - to pull the plug and vanish to a desert island - was twitching mightily. Über-burnt and now finding myself navigating shark-filled waters, my mind was starting to slide from the stress and exhaustion. A couple of colleagues at Chowhound began covering for me; vetting my outgoing mail, pre-reading stressful incoming mail, and generally checking in on me as if I were a doddering 90 year old with a heart condition. In 1998 I'd written a restaurant guide which involved reviewing 150 eateries, largely unknown gems. An inexplicable cosmic irony drove dozens of faves to close before my deadline, forcing me to ferret out replacements from scratch...and it's really hard to find excitement-worthy restaurants en masse and under pressure! Plus, I vetted all 150 shortly before deadline to ensure timeliness, which involved visiting ten or eleven per day for weeks, bringing along multiple shifts of eaters. It was an unimaginable nightmare, made all the worse by the fact that the research burned through $4000 of my own savings after my advance ran out. The only way I survived was by thinking of the long vacation I'd take after finishing the book. But that's precisely when Chowhound's popularity exploded, so the vacation never happened. The seven year slog commenced with my gas tank 3/4 empty. I'd been obsessing ever since about my missing vacation. Lately, the thought had me nearly foaming at the mouth. But this was no time to think of white sandy beaches. There was a business climate to take advantage of and an online community site to promote and protect...however contradictory those impulses might be. Attentive readers may have picked up on a demographic issue. I've noted several times that chowhounds are an otherwise ungatherable market segment; they're the crowd that resists conventional marketing manipulation (their common characteristic being, after all, an unwillingness to be herded via conventional marketing). But, um, doesn't that mean nothing can be sold to them? Is a marketing-averse audience really a good thing in an ad-based environment like the Web? Good catch, hypothetical reader! True, this audience is unsusceptible to the usual ditzy marketing of the usual mass market products. Chowhounds are uninterested in the dreary usual suspects, and impervious - even hostile - to the psyops of conventional marketing. But there are companies whose products are genuinely terrific, and who find themselves misfits in an advertising culture designed to hawk the humdrum to the masses. It's not easy to connect with an audience which staunchly appreciates quality. Chowhounds' appreciation of quality obviously extends beyond food. Nutjobs who trek 75 miles for slightly better muffins don't watch whichever crappy movie is on at the multiplex, and they don't buy uncomfortable socks just because they're on sale at Kmart. They don't purchase lackluster bicycles or radios, and their music collections are full of people who can really sing. These are discerning and diligent consumers, mega brand-loyal folks who not only appreciate quality, but pretty much live for it...and evangelize it! Companies with truly good products and services would love to connect with such consumers - consumers to whom they can pitch intelligently and on-the-merits. Companies like Virgin, Apple, Aveda, Saturn, Patagonia, and anyone with a particularly high-quality, high-value product - especially the new-and-exciting - could count on chowhounds to take interest, to early-adopt, and to spread word with ferocious passion. Where else can one find an audience so precisely tuned for that? It's a rare occurence, because such people, like cats, resist being gathered. The Value of a Frequent Flyer Mile...Officially! The value of a frequent flyer mile has generally been estimated at a penny or two. It's hard to say, precisely, because the airlines keep shifting the reward requirements and mile assignment policies. And, of course, the airlines never assign hard value to their award miles. But while reading through the fine print of a "Million Miles Sweepstakes" sponsored by Continental Airlines and TripAdvisor.com, I noticed the airline was forced to quantify the value. Since the grand prize is a million miles plus $5000, and they value the grand prize at $25,000, that values each mile at two cents. I've never understood people who insist they're right all the time, and who never allow their minds to be changed. Those with a deep stake in their own rightness ought to live for constant correction, because the only way to attain the Pinnacle of Rightness is by having all remaining dabs of wrongness systematically expunged. The conceited ought to thrill at being proven wrong, as it brings them one step closer to their self-image of utter perfection. Plus, what better way to seal the legend on one's grandness than to eagerly accept fresh ideas and publicly renounce faulty ones? Only terribly competent and secure people - studly, admirable, heroic people! - behave this way. So why isn't this a more popular pose? Similarly, people who want to be seen as tough and menacing ought to act immaculately gracious and deferential. One can best signal one's ability to harm by exaggeratedly declining to do so. This pose is slightly more popular (in fact, its roots go back to ancient times), as I learned while commuting to my first-ever music gig, with a blues band in a crack house in Roosevelt, Long Island. By waving a pedestrian to go ahead and cross in front of my car, I discovered that I had been perceived to have aggressively challenged him. It took years before I was able to unravel the psychology. Early in my food writing career, I met a famous food writer/editor, who'd attained her lofty position through unimaginable cunning and ambition. I was struck by how down-to-earth this person seemed, but there was a discernible "twist" to her humbleness. A certain sort of modesty broadcasts one's power more effectively than any boast, just as a certain sort of graciousness says "I could effortlessly crush you like a bug...but choose not to." If those who've decided to act like shmucks would simply take their shmuckdom all the way, the end result would be a more pleasant world. • Reduce heat and simmer 5 minutes, stirring frequently. 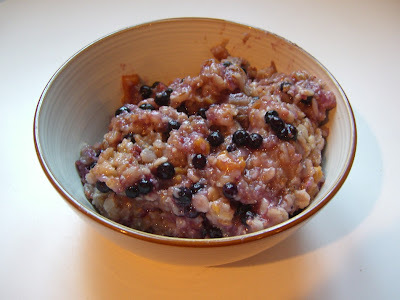 • Stir in blueberries, cover, allow to sit two minutes. A hallmark of selfishness is the nagging conviction that you're overly generous. And a hallmark of generosity is the nagging conviction that you're overly selfish. Ok, yeah. It's a depression. See this video of a corporate CEO currently delivering pizza, courtesy of ABC News. I enjoyed Revolutionary Road, which many critics described as a sequel to The Titanic. Leonardo DiCaprio and Kate Winslet are dried off and ensconced in upper middle class suburbia. But I thought it was particularly clever of Todd McCarthy, in his Variety review, to proclaim this the prequel to "Who's Afraid of Virginia Woolf" - the cinema's classic depiction of the endgame of suburban stultification. Yet I felt that none of the film's reviews came close to aptly characterizing the movie, which is about ego. The egoic yearning to feel special and central is crushed by a conformist existence. But there are enough small rewards within The Game to keep most people hanging on for a few decades. Revolutionary Road is about three people, one of whom sees the absurdity for what it is (and is certifiably insane), one who sees it but only waveringly (and who's merely suspected of being insane), and one captivated by The Game so long as a brass ring dangles just out of reach. It asks particularly deep questions about conformity. We've seen myriad stories about artists and dreamers bridling against conformist pressure. But Revolutionary Road shows noncomformist wannabes who utterly lack vision or talent. They only dream of being dreamers. That raises truly interesting questions about ego and conformity - questions the movie's too slippery and subtle to firmly answer. Clever though McCarthy's reference was, he completely missed the point of the film, as he did in his review of another of my favorites, The Remains of the Day. 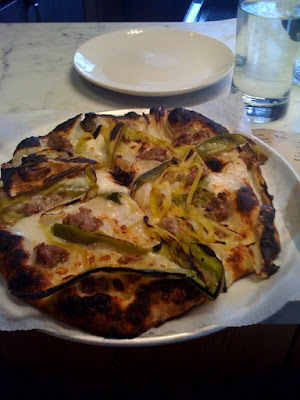 My first visit to Company, the new pizzeria from the Sullivan Street Bakery People (who I of course worship), exceeded expectations. This is the leek and sausage pie, with béchamel, parmesan, buffalo mozzarella, sausage, leeks, and breadcrumbs. And it was all about the really, really good bechamel. Le Freak: one of the most interesting beers ever brewed in America (mailorder here). Halfway through the gigantic DVD set of Simon Schama's "History of Britain". Fantastic...Schama's the heir to Bronowski and Kenneth Clark. Kashi's Autumn Wheat is the only breakfast cereal that can be described as beautiful. Weird, because other Kashi products are so inhuman. Crashed US Air survivortards are suing. These are indeed the Final Days. Cute new eTrade talking baby commercial from superbowl. Heh...for that matter, here's just about all the Superbowl commercials. God bless online video! Dear God how I love Trader Joe's triple ginger cookies. Which is Faster: Voyager or a Meteorite? Ok, here's a weird one. Which is faster: the Voyager space probe (our fastest ever), as it zooms out of the solar system with sufficient velocity to escape the sun's gravity, propelled like a slingshot by the gravitational fields of the gas giant planets...or a meteorite as it sails down to earth? You figured Voyager, right? Nope. It's only going 38,400 mph, while meteorites go 44,736 mph. I grew up in the era of "big premise" television series. For some reason, the networks maddeningly never reran the origin stories - the first episodes. You know, where Major Nelson finds Jeannie's bottle, Jed Clampet strikes oil, and the Minnow is lost. An article in the Economist makes the case that "cooking and other forms of preparing food are humanity’s 'killer app': the evolutionary change that underpins all of the other—and subsequent—changes that have made people such unusual animals." This research may have all sorts of ramifications, from nutrition to weight loss to debunking the raw food movement. My dad was a lexicographical reactionary. He fought the good fight against bastardization, and railed indignantly about "wrong" usage (the phrase "very unique" could make him downright apoplectic). And he was hardly alone. We all know language cops, or read their sputterings (that's not a word, by the way, so I've just raised the blood pressure of a certain portion of my readership) in books and in the media. But the thing is: they're all nuts, if you'll think about it (sorry, dad!). Language simply is. It bastardizes, it has always bastardized, and it's inherently flexible enough to accommodate an ever widening field of expression. And that widening has no sanctioning authority. Language is no more controllable than thought. No one owns language; the ivory tower has no more claim on it than it does on, say, economics. As in that field, the role of academics is not to dictate (i.e. tell everyone how to spend and save) but to observe, hoping to understand the natural process of things. Descriptivism rather than prescriptivism. Ages have passed since prescriptivism was acknowledged by professional lexicographers to be peeing into the wind at best - and bald-faced snobbery at worst. Yet we still expect dictionary editors to be crusty old fuds who'd sternly point bony fingers at our sloppy, careless, wrong-wrong-wrong use of language. The stereotype stems in large part from the work of uber-prescriptivist H. W. Fowler, who presumed to not only catalog language patterns he disdained, but to impose his predilections as a firm standard for the rest of us (split infinitives strictly intentional!). And generations of readers and writers hewed to his command. Prescriptivees, if you will (though a few of you emphatically won't). Have a look at how latter day dictionary editors view Fowler and his spawn, via this classic review of "The New Fowler's Modern English Usage" in the Atlantic by Jesse Sheidlower, editor at large of the Oxford English Dictionary. It's akin to a booster shot for staving off artificial constraint of one's self-expression. Years ago, long before that review was published, I called Jesse (who I knew from beer geek circles) to ask whether a certain formulation I'd come up with was an actual word. He clucked his tongue and shot back "Anything you say or write, which clearly conveys whatever you, a native speaker, intend to express, is a word". I'd never use that liberty to excuse lazy, unclear writing. But if the editor of the OED gives you free reign, that's as liberating as Fowler's injunctions once were hindering! "In making his announcement, Mr. Obama drew a strict line against human cloning, an issue that over the years has become entangled with the debate over human embryonic stem cell research. Sounds like ideology to me. And I share that ideology - I don't want to see cloning, either. But I'm inclined to be feel sympathetic to those upset by today's announcement. I may not draw the moral line where they do, but I do draw moral lines. As does Obama. So we oughtn't pretend that morality has absolutely no place in any of this.. It's the rage sweeping Hong Kong: Toilet restaurants. I hear the food's not too crappy, either! Thanks (if that's the right word), Barry Strugatz. "Historically, a president's first year is almost always his most productive. 'If you can't do it in your first term with your first budget, you almost never get a chance to do it later,' said Stan Collender"
"By reaching so high, Obama's fortunes rest on the economy. 'If the economy recovers and there's prosperity in 2011, he'll beat any Republican,' said Boston University historian Bruce Schulman. 'If not, many, many Republicans could beat him.'" In other news, former Bush speechwriter David Frum (the fellow who coined the "axis of evil" line) has written an article in Newseek titled "Why Rush is Wrong" about Limbaugh's recently-stated hope that the president of the United States "fails". Terrific ongoing piece last week in Slate working through the various theories explaining why America hasn't suffered a 9/11 style attack since, uh, 9/11.